How many of us have said or heard this before?! Our students have identified with this display and I've had lots of positive comments. They want me to do 'black' next time - typical! 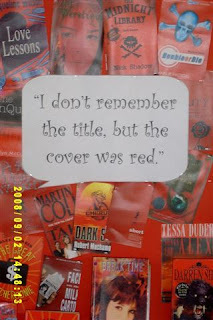 The books have flown from the display and I'm beginning to run out of red covers! I think I remember reading somewhere (many years ago during my library training days) that a library in England had actually added cover colours to their database to make it easier!